Home : Conservation : Lemurs – Tonga Soa! 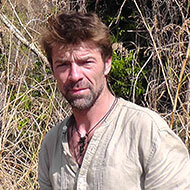 Jam ie Craig, the Park’s Curator gives his account of his conservation trip to Madagascar. In October, I was privileged to visit Madagascar to check up on a couple of the conservation projects we help to support so I could get a real ‘first hand’ view to report back to the keepers here at the Park and our visitors. The wildlife could have stepped out of the pages of any mythical beast book! We set out for Sahavola, near Brickaville in Eastern Madagascar, where the Greater Bamboo Lemur has been protected for many years by a local landowner. It was great to get to know the guides and villagers that ensure the groups found in this area are safe from persecution (the lemurs have an unfortunate habit of entering rice fields to supplement their diet of bamboo – not particularly popular with the subsistence farmers!). The three groups we saw in this area looked in excellent health and are a testament to what can be achieved with relatively little funding. The next stop was Dabolava in Central Madagascar to look in on our project for Crowned Sifaka. The landscape could not have been more different than the forested areas of the Bamboo Lemurs. Everywhere in the Central Highlands you can find the consequences of ‘slash and burn’ agriculture – as local farmers burn off the dried grasses and shrubs to encourage new shoots to sustain their zebu cattle herds. 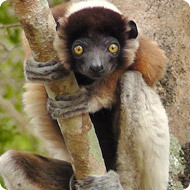 The small Sifaka group is found in a tiny fragment of forest surrounded by a moonscape of eroded hills. The project aims not only to protect the small group, but also to gain expertise in managing species in these forest fragments, something that is incredibly important as the human population continues to rise. We installed a trap to allow researchers to capture the animals for genetic testing and health screening to build up a picture of the viability of the group. Hopefully, these fragments can be linked in the future to allow animals to move between groups and improve the limited gene pool. Overall, it was an exhilarating and exhausting trip and the forested areas of the country are breathtaking and amazingly diverse places and the wildlife could have stepped out of the pages of any mythical beast book! The areas under pressure from human activities are rather different, and highlight the need for the careful conservation of these precarious populations that live, and need to continue to live, shoulder to shoulder with their human neighbours.